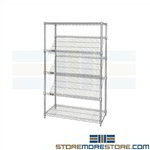 Wire shelving and racks are available in multiple configurations and promote a clean and dust-free environment with wire construction for healthcare, electronics storage, food storage, and more. 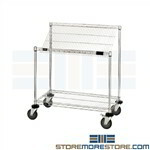 Steel racks are ideal for sanitary storage applications with plastic shelves that are easily removed and dishwasher safe. With 600 lbs. 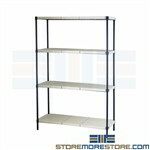 weight capacity per shelf, the plastic shelves will also not dent, chip, rust, or corrode to guarantee and long-lasting and durable storage solution for applications in healthcare, food storage, and more.